Asphalt Shingle Roofing is the most popular roofing application for single family homes throughout Montgomery and Bucks County PA. Griffith Exteriors offers a wide variety of different color and material shingles, always using the best available resources. The installation of a roof is a complex job, and when left to professionals shingle roofing is a long lasting and resilient application. With Griffith Exteriors being a certified Master Elite contractor, you can ensure Griffith Exteriors are the shingle experts! Once you have scheduled your project we will help you choose from a wide variety of GAF shingles, finding the best option for you. 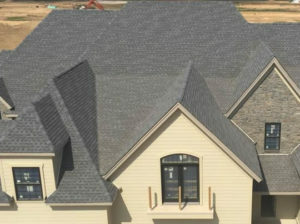 Our experienced and professional roofers will work efficiently to complete your new roof! What separates us from other Roofing Companies? Griffith Exteriors is a family owned and operated company dedicated to customer satisfaction. We are constantly working to better serve our customers, only offering the best resources and most qualified labor. We are here to provide long lasting and unparalleled home improvement. Our wide variety of roofing services in Bucks and Montgomery Counties are designed to not only fortify your homes structure, but dramatically change the look of its exterior. The quality of your roof is vital, so choosing the right roofing company is imperative! We work diligently with our customers to determine what the best options are for their home and particular environment, making sure they get exactly what they want and need from their new roof. We use only the highest quality materials and resources for our customers. Invest in a roof that will last, and guaranteed to satisfy. Be one step closer to turning your house into the beautiful home you’ve always wanted by contacting us today! Looking to do something a little different? Metal roofing is a great alternative! Not only are metal roofs durable, long-lasting and aesthetically pleasing, they also come in many varieties and colors! A metal roof is the perfect way to add an accent look to porches, sunrooms, etc. all while increasing the value of your home.